Posted on February 8, 2010	by Michael Gorton, Jr. It seems on Long Island that there is an emphasis on Merlot and to a growing extent Cabernet Franc. But probably the most widely grown and versatile grown grape on Long Island is Chardonnay, in my opinion. You will find it in sparkling wine, fermented in an oak barrel, in stainless steel tank fermentation and in a desert wine format. While I like chardonnay, I also dislike chardonnay; I am constantly flip-flopping with with this varietal. One week I like barrel fermented; the following week I like it stainless steel fermented; or a nice simple blend of the two. Or I go to the other extreme and wonder why I even like this grape. 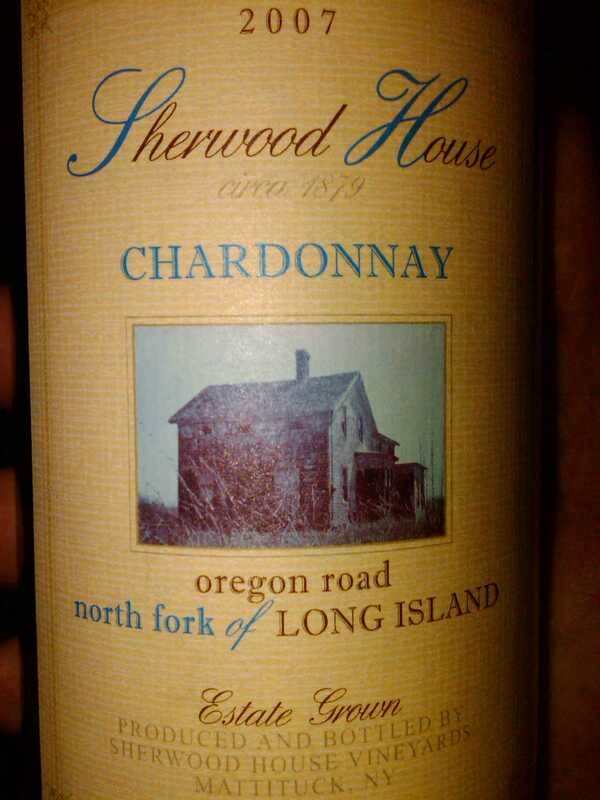 Then I open up this bottle of Sherwood House 2007 Chardonnay. And I have a little of an A-Ha moment. Not in the “Take on Me” sense, but in an A-HA kind of way. But I did take this on and I enjoyed it. On the nose I was picking up some Lemon, citrus, grapefruit and some rope pear. There was some aroma of fresh-cut grass and maybe a little straw. The nose was very “clean”, not much happening, just the typical aroma of your average chardonnay. Then the taste. The first thing that I recognize is the razor-sharp acidity, which cleanses the palate. There unfolds layer upon layer of flavor. From Lemon zest to citrus lime, to a hint of pineapple and tropical juice. There is a wonderful river rock, slate minerality that works well with the mouth coating sensation of a chardonnay. It had a medium finish with a hint of peppery spice at the end. This was a chardonnay that gave you the buttery mouth feeling without the butter. It was palate cleansing and would have been a great apéritif. This could have been an excellent summer quencher, but I had this in the winter. It made me warm and toasty this cold night and wanting another bottle. This entry was posted in 2007, Chardonnay, Long Island, Sherwood House. Bookmark the permalink. Your description of Chardonnay is pretty amazing. Not a topic that funeral directors usually talk about, but interesting. thanks for the post! do you know if it underwent malo-lactic fermentation? I did some research and found nothing that states it underwent Maloltic Fermentation. I doubt it did because of presence of the acidity and lack of buttery mouth feel you tend to see in California Chardonnay. Would you mind if I borrowed your picture of the Sherwood label for my own blog, The Grape Belt?I had this wine last week at the Oyster Bar in Manhattan and was quite impressed with its quality, impressed enough to mention it in the post I’m writing. Tom, Thanks for reaching out. You are more than welcome to use this photograph and any other photograph on my blog. Glad to hear you liked the wine and I can’t wait to read the post.